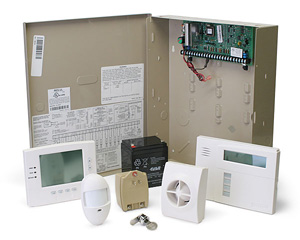 Solid State Alarms, Inc. offers an array of tools to secure your livelihood. From external security threats, to internal theft we’ve got you covered. We offer many security, fire, video monitoring and access solutions to ensure your business is protected. We use the latest in technology and equipment that’s backed by over 34 years of solid experience. Call us today to speak with our highly trained and experienced staff, or visit our online scheduling tool for your free security evaluation and estimate. Solid State Alarms, Inc. uses Honeywell’s Silent Knight series for the ultimate in fire protection. Since 1961 Honeywell’s Silent Knight has been providing reliable, industry leading fire and life safety systems worldwide. Silent knight has a broad portfolio of life safety systems backed by Honeywell, a manufacturer that meets and exceeds our high standards. Silent Knight fire systems are found universally in commercial buildings nationwide. Why lower your standards and choose anything less? Running a business is a huge responsibility. Watching the bottom line, and keeping things running smoothly and efficiently is a heavy task. Don’t worry, we can help! We utilize the latest technology and equipment allowing you to keep an eye on your business, employees and customers even when you can’t physically be there. With Honeywell’s Total Connect services, the boss is always in! Watch the video below (or wherever it is), and give us a call to learn more about Total connect, and all of our other video and recording solutions from cameras to DVR recorders and remote access! Let us show you how Solid State Alarms, Inc. can provide you with all of the tools and technology you need to set access controls for individual employees, visitors, patients or tenants. In the modern world we live in, access to critical, proprietary information and even hazardous materials is extremely crucial. View in real time, change access levels, get alerts and more from any web-enabled device. Start with up to three doors and easily upgrade as your business grows. This is custom security at it’s finest! Already have a security or fire system? Paying too much? Let Solid State Alarms, Inc. monitor your system! We are partnered with C.O.P.S monitoring, one of the largest independently-owned wholesale alarm monitoring companies in the United States with five load-sharing central stations, (based right here in south Jersey) and has been serving Dealers for over 34 years. We offer shorter contracts than our competition, lower rates and better service. Plus, we do not charge to switch your monitoring to our service. Just one more reason to choose Solid State Alarms, Inc.